McDonald’s, the largest fast food chain in the world, is leaving no stones unturned to strengthen its desi image in India. In the latest initiative, the US food giant has roped in popular Indian cartoon character Chhota Bheem to sell various items through its retail outlets in India. McDonald’s outlets will start selling exclusive Chhota Bheem goodies, including a goodie bag that has pencils, sharpener, eraser and a ruler and Chhota Bheem cushion, besides a scribbler kit. “Chhota Bheem is one such great local brand of cartoon characters that has endeared itself to the children in India. “It was conceptualised in India, produced by Indians for the Indian children. It’s these set of values of the character that motivated us to partner and sell the Chhota Bheem goodies at McDonald’s,” said Ruchin Khanduja, general manager-marketing, McDonald’s India (north and east). With a viewership of 40 million people, Chhota Bheem is rated India’s top animated TV series. Apart from McDonald’s, Chhota Bheem brands are used at about 10-12 various groups, including Max Super Markets and Horlicks. Reynolds Pen is also launching a Chhota Bheem series to attract young customers. 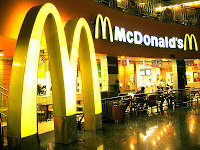 A lion’s share of McDonald’s revenue in India comes from its vegetarian menu, which offers products such as vegetarian burgers -- Mc Aloo Tikki, McVeggie, McSpicy Paneer and BigSpicy Paneer Wrap. It has also launched a vegetarian breakfast menu for its Indian customers. “To localise or becoming desi are efforts to endear our brand to Indian consumers. “It started as we set foot in India with our first restaurant. “Vegetarian menu, segregation of kitchen into vegetarian and non-vegetarian sections, not having any beef or pork based product on the menu are some of the world’s firsts in India for McDonald’s,” said Khanduja. In 2011, related to the release of Shahrukh Khan’s movie Ra One, McDonald’s had launched Happy Meals containing a Ra.One miniature robot toy G.One, played by the Bollywood actor in the film. “We are quite open to tying up with the ideas and concepts that communicate great human values; and are inspiration to the children,” added Khanduja. According to reports, McDonald’s has plans to start vegetarian restaurant near the Vaishno Devi temple in Jammu and Kashmir, and another one near the Golden Temple in Amritsar. The company has set a target of 500 stores across the country by 2015, reports say. Chhota Bheem Contest: Win EXCITING prizes!